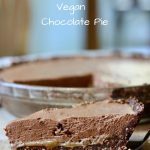 OK LETS TALK VEGAN CHOCOLATE TART! I like to make my crust first, then the caramel sauce, and while the caramel is cooling I make the vegan chocolate mousse. That’s if I make it the same day. 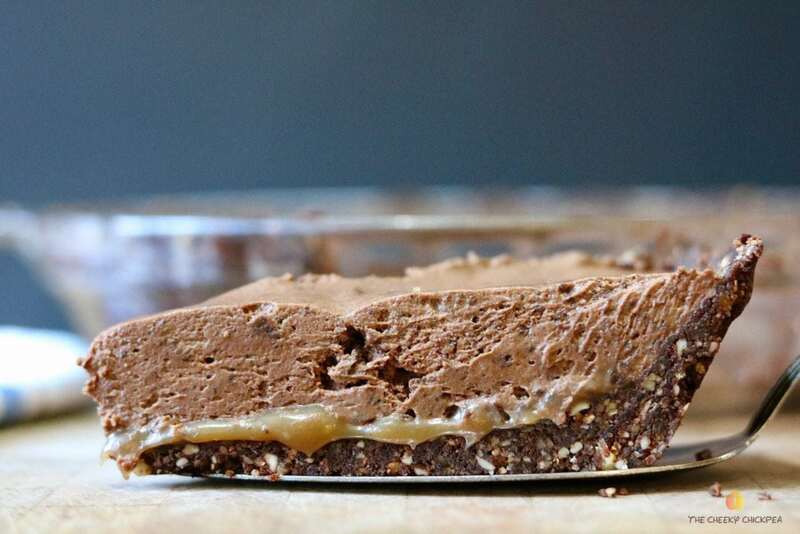 You can make the crust and the caramel a day or two ahead if you wish. 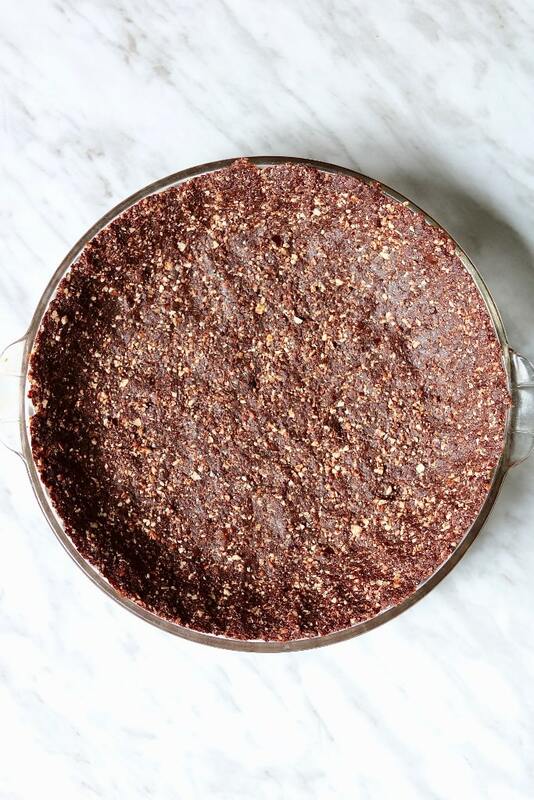 Let me just say this vegan chocolate nut pie crust is delicious by itself – seriously not kidding! 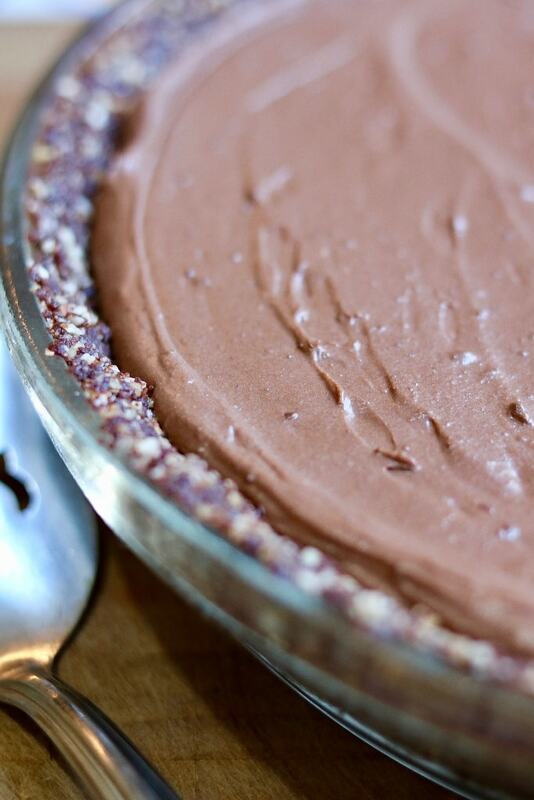 I based my Nutty Vegan Chocolate Truffles Recipe on this crust. That’s how tasty it IS. Start by processing the nuts in the food processor till they are completely broken down. then add the rest of the pie crust ingredients and process till you have a mealy, nutty mixture. Now spread the nut mixture evenly in the pie plate, and up the sides as well. Start pressing the mixture firmly with your hands, starting on the bottom at the base of the pie plate and then working your way up the sides. This is super easy as there is a generous amount of crust, so you’ll have lots to work with. Chill in the fridge till you’re ready to assemble. This chocolate mousse is absolutely delicious and so easy! I’ll definitely be creating a separate post for this Easy Vegan Chocolate Mousse Recipe. Ok start by breaking up the chocolate bars into a medium sized mixing bowl and set aside. Next add coconut milk to a sauce pot and heat until just hot and steaming. Add the coconut milk to the chocolate, add vanilla and stir until chocolate is melted and it’s mixed well. Chill in the fridge for 30 minutes, give it a stir with your spatula and return to fridge for another 30 minutes ( 60 minutes total). Now remove from fridge, stir the chocolate mousse with spatula and then beat with electric hand mixer for 2-3 minutes. The mousse should thicken more and hold its shape. Add the coconut milk to a medium sized heavy bottomed sauce pot. Bring the sauce to a boil then reduce heat and simmer uncovered for 20-25 minutes, stirring frequently. Scrape down the sides of pot a few times with spatula. remove from heat, add the rest of ingredients. Voila! 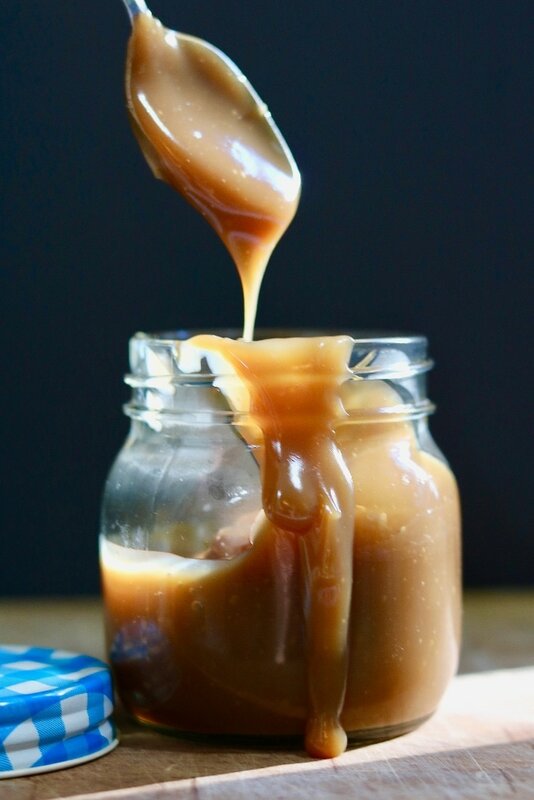 Best Vegan Caramel Sauce, BOOM! That’s it folks, yes there’s a few steps to this pie but they are all easy. so come on guys lets make one of the easiest and best Vegan Chocolate Tarts you’ll ever taste. Delicious as a Vegan Ice Cream Cake!! Enjoy you Guys! Happy Day😊 Feel free to comment below, I’d love your feedback. 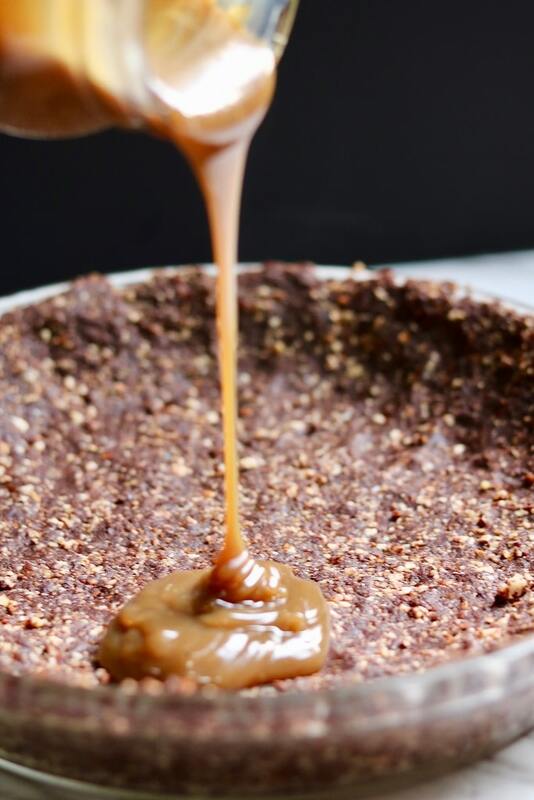 Check out Salted Caramel Vegan Chocolate Pie VIDEO below! 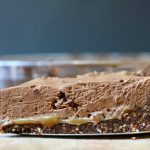 You will LOVE this easy no tofu, no bake Vegan Chocolate Tart recipe. 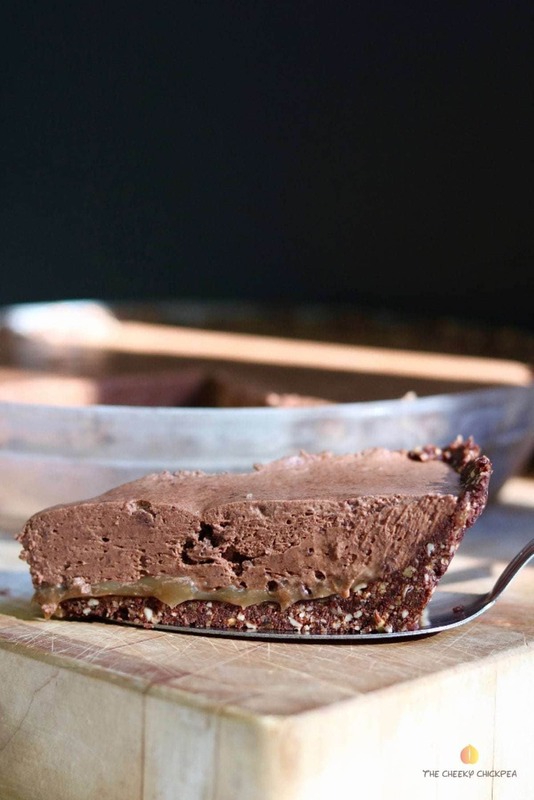 Gooey rich salted caramel, melt in your mouth silky and light Vegan Chocolate Mousse, a top a delicious chocolate nut crust. Oh Man! And it’s soy free, gluten free and oil free to boot! with no added sugar😳 HUH! Add the dates to a soup bowl and cover with boiling water to soften, about 5 minutes is good. While Dates are soaking add the almonds and walnuts to the food processor and process till completely broken down. Drain the dates well and add them to food processor with the rest of pie crust ingredients. Process everything well .You might have to scrape sides of processor once or twice, you should end up with a mealy nutty mixture. Now spread the nut mixture evenly in your pie plate, and up the sides as well. Start pressing the mixture firmly with your hands, starting on the bottom at the base of the pie plate and the working your way up the sides. This is super easy as there is a generous amount of crust so you’ll have lots to work with. Add coconut milk and maple syrup to a medium sized heavy bottomed sauce pot . Bring the sauce to a boil then reduce heat and simmer for 20-25 minutes, stirring frequently. Scrape down sides of pot a few times. Start by breaking up the chocolate bars into a medium sized mixing bowl and set aside. Next add coconut cream to a sauce pot and heat till just hot and steaming. Remove from heat and add it to the chocolate, add the vanilla and stir till chocolate is melted and its mixed well. Put the chocolate mousse in the fridge uncovered for 30 minutes. Give the chocolate a stir and return to fridge for another 30 minutes. (60 minutes total) Now remove from fridge, stir the chocolate mousse with a spatula and then beat with an electric hand mixer for 2-3 minutes. The mousse should thicken a little more and hold its shape. If it’s not thickening return to fridge until it firms up, then Spread the mousse onto pie. 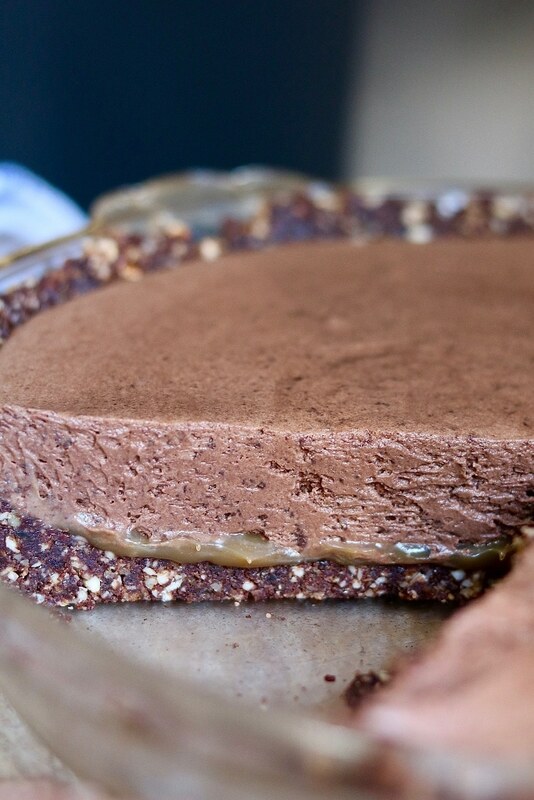 Remove pie from fridge, add chocolate mousse on top of the caramel layer and spread evenly. quite often I make my caramel sauce the day before and just reheat in microwave till the sauce is pourable. I recommend the Great Value chocolate bars from Walmart, they are perfect for this recipe and the price is right and the quality is great ( made in Switzerland). Gives the mousse the perfect sweetness. If you find the chocolate mousse is ready but the caramel sauce layer is still warm just place mousse in fridge until you’re ready, not to long though, it will start to set. if it gets to stiff just set on counter for awhile till its spreadable. OH MY! This looks seriously appetizing. Thanks so much for your comment Joy! It is definitely very tasty😊 Have a super day! Fantastic balance of salty and sweet. Perfect dessert! I am drooling over this recipe I can’t wait to try. Ha ha thanks Beckett! It’s definitely drool worthy 😊 Thanks for your comment! This looks so good!! Might have to give this a go closer to Christmas. Is there a good substitute for the instant coffee? None that I can think of Janet. You could leave the instant coffee out, but it’s Sooo much better with it. Makes the caramel much richer tasting. If you’re worried about caffeine just buy decaf instant coffee, that’s what I use😊 Have a great day! Hi Karen, yes that could be why. I only use reg coconut milk, lite is thinner. I would think It should still thicken when it starts to cool though😊 You simmered it uncovered, right? It will still be delicious don’t worry. Let me know the outcome. I never leave reviews. But oh my was this good I’ll be sharing this one with my non vegan friends to shock and wow! What is cocoa % on the Walmart chocolate bars? Wondering if the ones I have on hand will work?! Could you use a graham cracker crust for this? My son is allergic to walnuts. Thank you! Hi Michelle, I’ve never made it with a graham cracker crust, but I’m sure it would work, or you could try using half sunflower seeds and half pumpkin seeds in place of walnuts. Let me know how it goes😊 Have a great day! This crust….yummm! I make just the crust and caramel sauce, cut into squares, and freeze. When I get a craving for something sweet I thaw a slice and top with vegan ice cream. A healthier, and honestly better tasting, version of a hot fudge brownie. So good!